Competition for infrastructure financing is heating up in Asia. China is investing billions in mega-infrastructure projects under President Xi’s Belt and Road Initiative (BRI) as well as designing new financing mechanisms beyond the Bretton Woods institutions. Against this backdrop, the Asian Development Bank (ADB) now faces the challenge of reforming itself and remaining competitive as it commemorates its 50th anniversary. In the face of growing Chinese investment, Japan has stepped up its game through Prime Minister Abe’s Extended Partnership for Quality Infrastructure and by further augmenting the ADB’s role in catering to the infrastructure appetite of emerging economies. As the ADB debates its ‘Strategy 2030’,which will be in place by 2018, it must facilitate institutional and organisational reforms necessary to maintain its relevance. As Obama administration’s and Japan’s attempts to steer the initial debate on the AIIB failed to stop US allies from joining the China-led bank,the need to reform existing Bretton Woods institutions, including the ADB, has intensified. The ADB remains under the control of Asia’s traditional regional actors including Japan and the United States with 15.6 percent shareholding each in 2016. There is a need to revisit this approach and create more space for emerging economies in the bank’s governance structure. China, India and Indonesia have 6.4 percent, 6.3 percent and 5.4 percent of shareholdings respectively in 2016. As the US-led international economic order has failed to reflect the shifting alignments, the ADB must grow in order to respond to the varying needs and ambitions of its developing member countries. 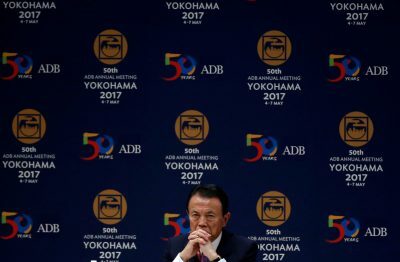 While international attention was focused on Beijing’s recent Belt and Road Forum (BRF) on 14–15 May, a week earlier Japan celebrated the ADB’s 50th anniversary in Yokohama. Since infrastructure financing often translates into expanding geo-political influence, Japan has committed US$40 million over a two year period to a high-technology fund to support the application of innovative solutions throughout the project cycle of ADB-financed and administered sovereign and non-sovereign projects.The fund will be effective by July and will focus on critical areas including climate change, smart grids and renewable energy. Two years ago, weighing the impact of the AIIB, Abe designed the Partnership for Quality Infrastructure and argued that Japan in cooperation with the ADB will provide ‘high-quality and innovative’ infrastructure and pledged US$110 billion over five years — a 30 percent increase from earlier funding. At the Yokohama meeting, Japan called for promoting infrastructure projects to be the mainstay of ADB operations and to further muster private sector financing together with public-private partnerships. In February 2017, the ADB estimated that Asia will need US$26 trillion for infrastructure from 2016–2030.Economic rationale dictates that the ADB has enough space to operate alongside new development banks while addressing the infrastructure financing gap. ADB has adjusted with new realities and opened up to co-financing with the AIIB. The two banks signed a memorandum of understanding aimed at strengthening cooperation including co-financing in May 2016. They are co-financing the National Motorway M-4 Project in Pakistan, each financing 36.6 percent individually of the total project cost of US$273 million. ADB has approved co-financing with AIIB in Bangladesh and Myanmar. In the run up to the BRF, ADB President Takehiko Nakao argued the merits of cooperating with the BRI design. While Japan’s national leadership refrained from attending the summit, Liberal Democratic Party (LDP) secretary general, Toshihiro Nikai and the Keidanren chief, Sadayuki Sakakibara were both present. This decision has been shaped by larger geo-political and geo-strategic variables. President Trump’s evolving Asia policy, fluidity in US–China relations and the North Korea conundrum are making Japan weigh up its options carefully. AIIB membership has expanded since its inception. Japan has learnt it the hard way during the initial AIIB membership debate about the demerits of non-engagement and losing the opportunity to shape decisions from within. The United States and Japan are the only two G7 countries that kept out of the AIIB. At a time when BRF witnessed representation from over hundred nations and domestic debate over the AIIB is intensifying in Japan, Tokyo needs to revisit its stance on the China-led bank on one hand and drive the debate to facilitate pertinent reforms in ADB on the other. For 50 years, the ADB has worked towards inclusive economic growth, environmental sustainability and regional integration. It’s lending focuses on infrastructure, education, environment, health, financial sector and so on. In 2016, the bank approved US$17.5 billion in financing, disbursed US$12.5 billion and attracted US$13.9 billion in co-financing. While it has fuelled Asia’s growth, garnering resources for infrastructure, poverty mitigation and supporting financial inclusion will remain ADB’s priorities. Developing its lending capacity, the bank has merged the Asian Development Fund with the Ordinary Capital Resources. Moving ahead, ADB has agreed on a new procurement design and is firming up on delivering knowledge solutions and facilitating innovation and integration of high-level technology in projects. The call for re-evaluating ADB’s voting rights is not new. Critics argue that present international institutions should permit space to developing nations and that failure to do so will hurt the relevance of these institutions.The emerging economies have long argued for representative governance, rationalising operations, easing the ADB’s internal processing time and encouraging public-private partnership investments. Japan must take the lead to facilitate governance reforms against the backdrop of AIIB and other new multilateral development banks. Failure to implement internal reforms will impact the ADB’s influence. Developing Asian nations will be the beneficiaries of this race for infrastructure financing. Productive competition will diversify emerging economies’ options to choose the most favourable financing terms. Long-term, this will support the larger purpose of empowering emerging Asian economies to augment national growth and enhance Asia’s ability to compete in the global economy. By Titli Basu.